STRANGERS 2: OF BLOOD AND FIRE STRANGERS 2: OF BLOOD AND FIRE by Jean-Marc & Randy Lofficier; art by Mariano De La Torre, Anthony Dugenest, Alfredo Macall, Pierre Minne, Fernando Pasarin, and Studio Cirque. Cover by Pierre Minne. - #5. Virgin or Demon? HOMICRON is a NASA scientist whose body is inhabited by a mysterious alien from planet Alpha. STARLOCK is the former servant of supremely powerful cosmic entities who has managed to escape from his Martian prison and is hiding on Earth. FUTURA is a mysterious woman from a parallel dimension. JALEB is the secretive agent of a Galactic Federation of telepaths. 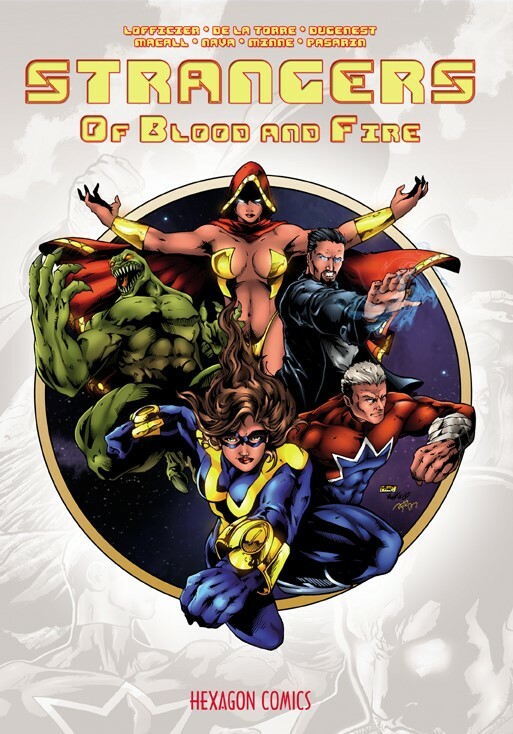 These characters, all “strangers” to Earth, are brought together by TANKA, a former jungle lord who has been recruited by entities from our planet’s farthest future to be their “time agent” and is now empowered to protect our world from extra-terrestrial menaces. In this first volume of the second season, from Paris to New Orleans, Jaleb and Futura search for Wathan, the secret agent of the Great Mind who seeks to plunge Earth into total chaos. Meanwhile, Homicron faces the judgment of her own race on Alpha and Tanka and Jaydee face another Salamandrite on the island of Haiti. With special guest-stars: Phoenix, Hunter and The Dark Flyer! Strangers takes place entirely in the over 60-year-old fictional universe of Editions Lug, now Hexagon Comics, one of France’s oldest comics publishers which, from the 1950s to the 1980s, published nearly 300 popular comics starring numerous characters in genres as varied as superheroes, westerns, science-fiction, horror, heroic fantasy, jungle action, war, and historical swashbucklers.